Summary: On 11/29/15 at approximately 1:43 a.m., officers responded to the scene of a vehicle vs. pedestrian hit and run fatal traffic collision at 1200 W. 1st St. The investigation revealed that a blue obsidian pearl Honda Accord (midnight blue) struck a pedestrian as the pedestrian was crossing 1st St. The Honda fled from the scene westbound on 1st St. without providing identification or rendering aid to the pedestrian. On 12/30/15, investigators received a tip from Orange County Crime Stoppers which lead to locating the Honda at a body shop in Bloomington, CA. The damage on the vehicle was consistent with the collision and the vehicle was missing parts that were located at the scene of the collision. At approximately 1:20 p.m., the registered owner was contacted at her residence. 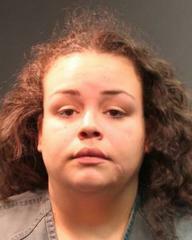 She was subsequently arrested and booked for 20001(a) VC-Felony Hit and Run. Summary: On 11/29/15 at 1:43 AM, Officers responded to a report of a hit and run traffic collision involving a pedestrian at 1200 W. 1st St. When the officers arrived, they located the deceased pedestrian lying on the center median. Witnesses to the collision said the vehicle involved sped up after the collision and traveled westbound on 1st St. then southbound on Bristol St. The witnesses described the vehicle involved as a newer model Honda, Accord, 4 door, obsidian blue pearl (midnight blue) with tinted windows. Investigators located the driver’s side mirror and part of the front bumper assembly at the scene. There should be substantial damage to the front end of the vehicle. Anyone with information is asked to contact Orange County Crime Stoppers 1-855-TIP-OCCS.